Virtual reality "transforms the experience," says developer. 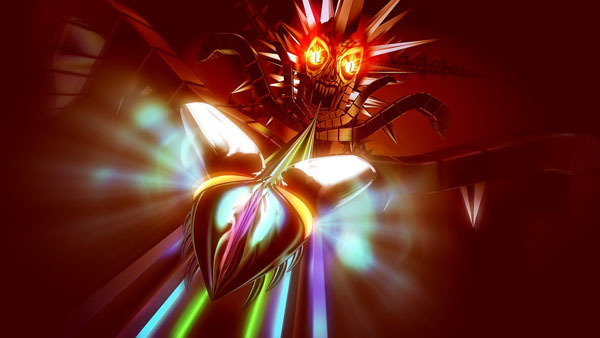 Thumper, the “rhythm violence” game announced by independent developer Drool last June, will support PlayStation VR when it launches later this year, the studio announced. The game puts players in the role of a space beetle making its way towards a maniacal giant head. It uses simple controls, but pushes the sense of speed and physicality to “extremes you’ve never felt in a rhythm game before,” according to Drool’s Marc Flury. According to Flury, Thumper‘s gameplay “translates perfectly” to virtual reality and “transforms the experience” in ways you wouldn’t expect. That said, the game will be playable both in 2D and in virtual reality. So you’ll be able to play Thumper regardless of whether you own a PlayStation VR headset. Watch a new trailer below, introducing some new gameplay mechanics. In the early levels, your movement is limited to a single high-speed lane, but as the difficulty rises, you’ll slide across multiple lands of rhythmic cues and obstacles.